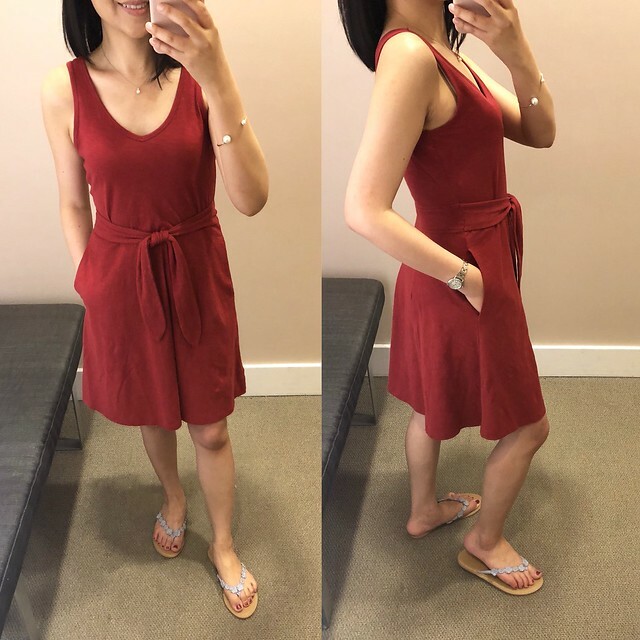 I’m quickly popping in to share a few new reviews since LOFT just upgraded their Memorial Day weekend sale to include FREE shipping on all orders (use code SURPRISE)! Shop my sales picks at the end of this post. Sadly they took away the yay of the day deal when they made this latest change in sale but I know a lot of you were hoping for lower minimum shipping. This dotted split neck top is really cute and it runs a bit larger. Size XXSP fits like size XSP and I like the longer overall length. Update 6/18: This style is also available in a floral print and solid color here. My eyelet shorts are currently sold out but this rope tie pair (reviewed here) is another great option if you’re looking for white denim shorts. 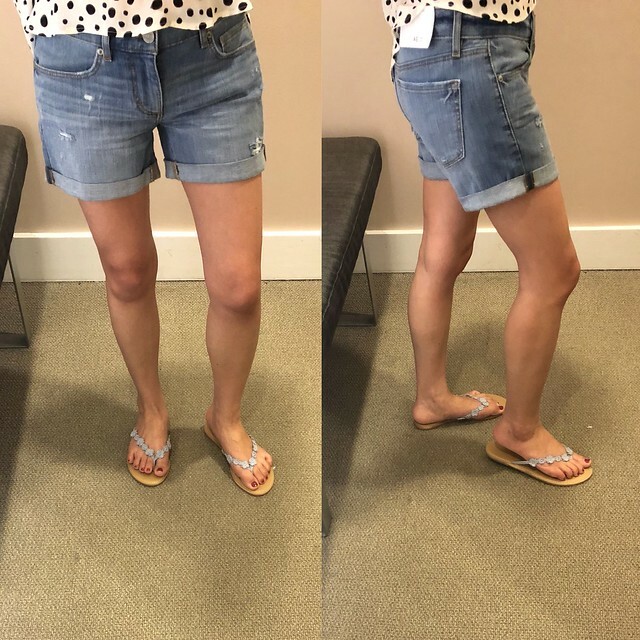 This pair of denim shorts has a longer inseam. The wash is very versatile and it has some very slight distressing that for some reason is not shown in the online stock image for the lighter of the two washes. Size 24/00 fit me well and it’s true to size in the waist but sometimes LOFT shorts make me look like Spongebob Squarepants in the crotch. 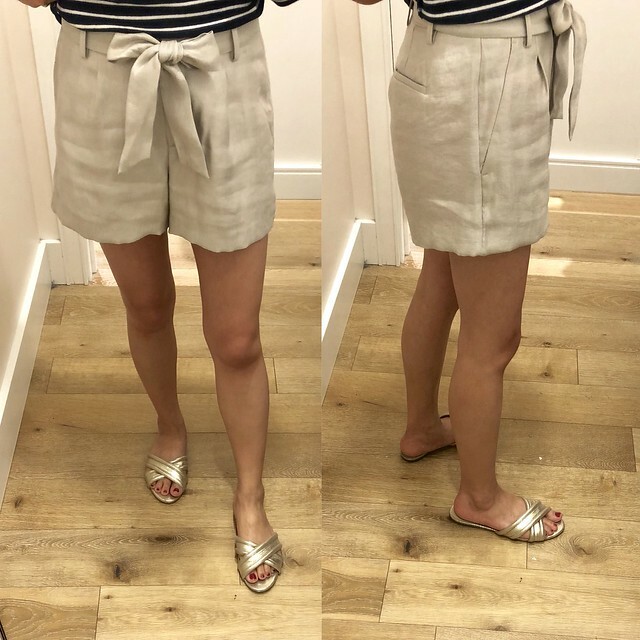 I’ve been curious about these shimmer tie waist shorts and I finally found it to try on in petites. The waist fit me true to size but the legs are a tad baggy on my thinner thighs. This pair seemed more wrinkly/crinkled than the other pairs I saw on the tables almost like someone had worn/returned them. This skirt is such a pretty print and size XXS regular fit me well in the waist. It’s a faux wrap style so there’s no risk of flashing anyone with a wardrobe malfunction. I felt like I didn’t fill in the skirt through the waist so I passed on the skirt but if you’re slightly curvier then it should be more flattering. This navy dress is really pretty but the armholes are a bit more generous than I prefer. You may notice more armpit flesh on display as you can see from the above left picture and if you view the video clip I linked to. Otherwise size XSP fit me true to size and it wasn’t too swiny. Lastly, I bought this dress in store yesterday when it was part of the yay of the day deal for $25. Size XXSP fits like size XSP. Please check out all of my recent LOFT reviews here. 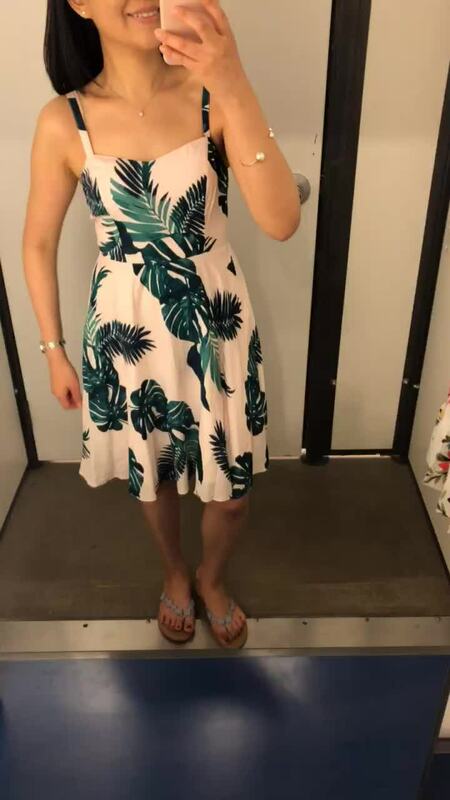 I saw this dress in Lilly‘s try-ons here and I had to try it on myself. Unfortunately, the armholes are cut a bit narrow and higher so it shows more armpit flesh than I prefer. Size 00P fit like size 0P with plenty of room through the waist and hips. If you have a straighter figure like me then this dress may run one size bigger. If you’re curvier then this dress likely runs true to size or you may need size up to accommodate your hips. This dress is fully lined and not see through. 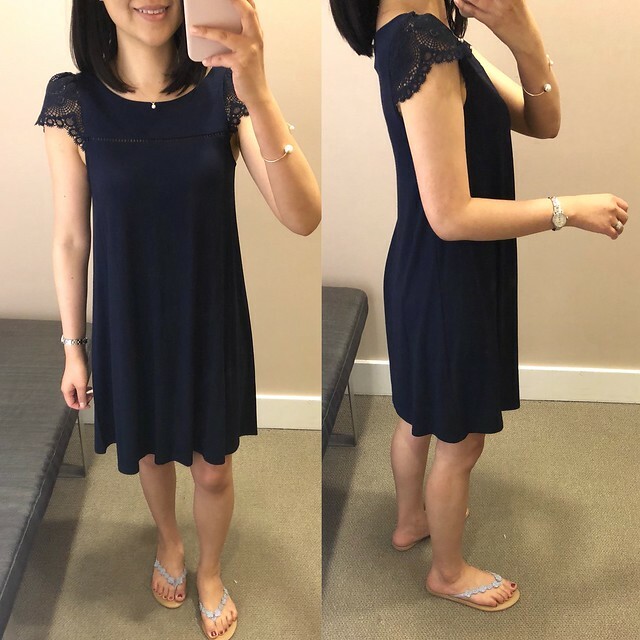 Update 6/14: I ended up picking up this dress in my usual size 0P which fits loosely through the hips but the arm holes are more comfortable. 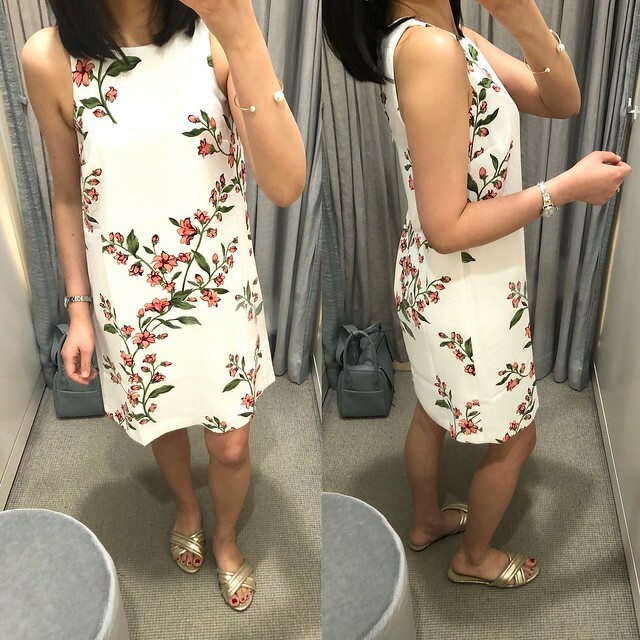 Please check out all of my recent Ann Taylor reviews here. 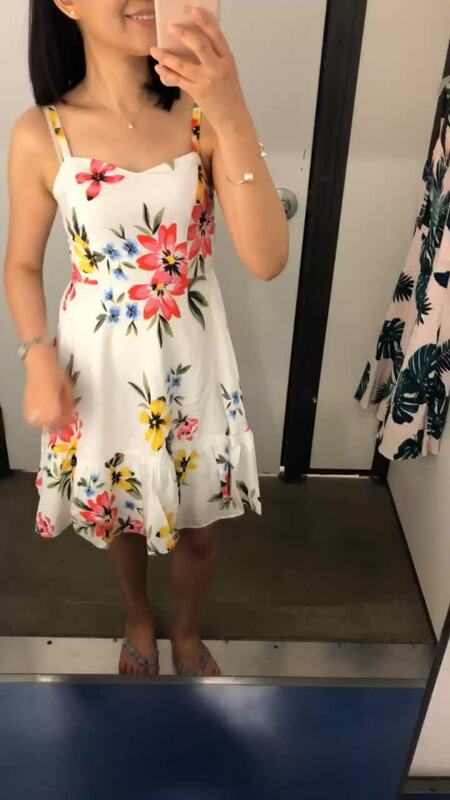 This floral print dress is so lovely! I happened to pass by Old Navy and I tried on both prints in size XS regular but I took home the turquoise palm print below. Size XS regular fit me well and runs small in my opinion. The length is petite friendly and hits just above my knee caps. The straps are adjustable and I like the sweetheart neckline. It’s also currently on sale for only $15! For reference I’m 5′ 2.5″ and currently about 105 pounds. Please check out all of my recent Old Navy reviews here.